Lemon is adorable. I’m trying very hard to get some pictures, but he won’t sit still – when he’s not trying to climb up my arms, he’s running around trying to attack nothing. We have grand hopes for Hobble and Lemon – they managed to sleep for a bit on the same bed. I blew it, though – Ed kept picking up Lemon and slowly moving him towards the snoozing Hobbs, and I couldn’t stop laughing. That woke Hobbs up, who saw the kitten, and jumped off the bed. I couldn’t help it. Too funny. The tiny, tiny kitten chased the enormous Hobbs around the room for a bit, then plopped down to get some more sleep. We’ll try a visit again tonight, but Hobbs doesn’t seem completely opposed to the idea (Cheddar will come around, and Sasha will continue to destroy the universe) so we may have peace – and dare I hope, snuggles – some day soon. I’m very much enjoying my day off. I spent much of the morning snoozing and playing with Lemon, and now I’m about to head out to do a few quick errands. It’s all very domestic in here today, but I don’t mind. There is kitten. He is tiny and pointy and so very cute. I LOVE LEMON!!!!!!! adorable!! KITTENS RULE! Do you have any tips for integration? We’ve picked up two stray kittens and would like to keep them…but already have two full grown cats. Lilac point? Burmese? Looks a little too long haired to be a siamese, even a traditional or apple head. 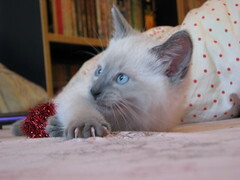 He’s adorable – AND, I might add, that our favorite cat (of six) is a lilac point as well. I hope that little lemon brings tons of spark, entertainment and snuggles to your household! 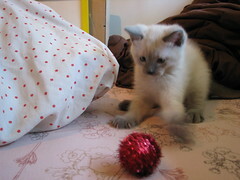 He’s destined to – he’s a lilac point! Oh, and in re: integration – we have six cats, all integrated one by one, and vanilla has done wonders for us. Put a little just above their noses and under their chin, then take a towel and rub each cat vigorously with it. Makes everyone smell the same and makes integration a tad easier. LURVE! I WANT YOUR KITTEN!!! Too cute. he’s a beauty and a keeper!